It's easy to design and print custom party bags using clip art and paper lunch bags. All you need is a picture, clip art image or word art set up using a word processing program, an inkjet color printer, and a package of standard size flat-folded paper lunch bags. I like to use white lunch sacks, but sometimes I use brown bags. Lately in a few of the party stores I've seen full color paper sacks that would be fun to print on, too. The choice is up to you, and also to what type/size bags are compatible with your printer. Here's a snapshot of a set of Trick or Treat candy bags I designed and printed at home for our Halloween visitors. The artwork is my own clip art, plus I used a creepy font to add our names. 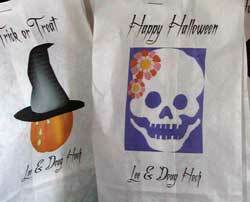 I printed these Halloween designs on white paper lunch bags. I think a harvest party design, pirate party design or Christmas cookie bag design would print nicely on brown bags! Here are the basic steps. Design your artwork - use the height and width of the flat folded lunch bag dimensions as the document size and leave a 1-inch margin all around the edges. Load one paper bag into the printer paper tray - take care to load it so the side you'll print on will be the full flat side of the bag. Print your party bags - print 1 bag at a time to avoid jamming in the printer.